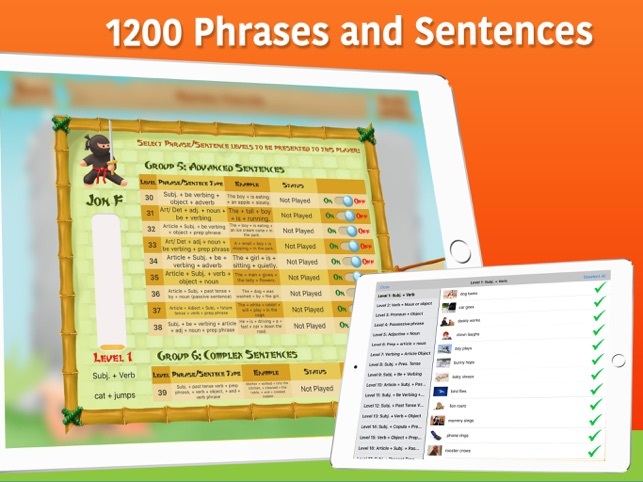 Sentence Ninja is a multi-player multi-level app designed to improve sentence structure skills in children and adults. 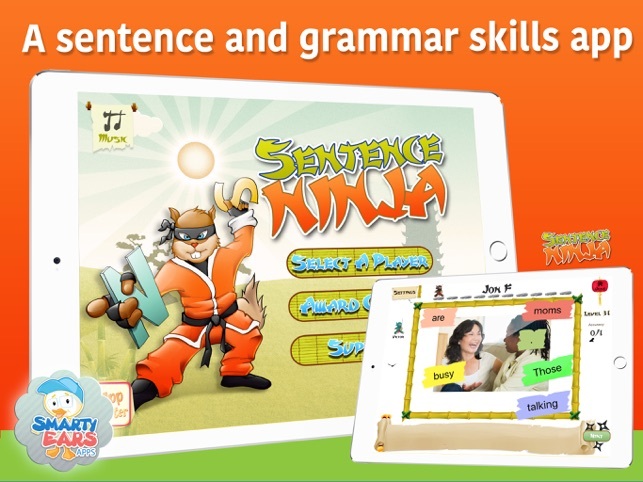 Designed by a certified speech-language pathologist, Sentence Ninja uses a fun Ninja theme to engage clients in their learning while teaching word order. 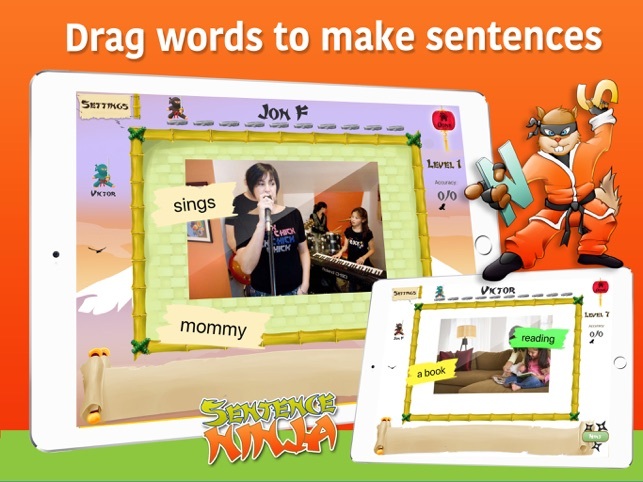 Easily customizable to fit nearly every need, Sentence Ninja is a great addition to the therapy toolbox. Created to facilitate an understanding of how correct word order impacts sentence structure, Sentence Ninja has 39 levels ranging from simple phrases to complex sentences. Each phrase or sentence has a corresponding picture. 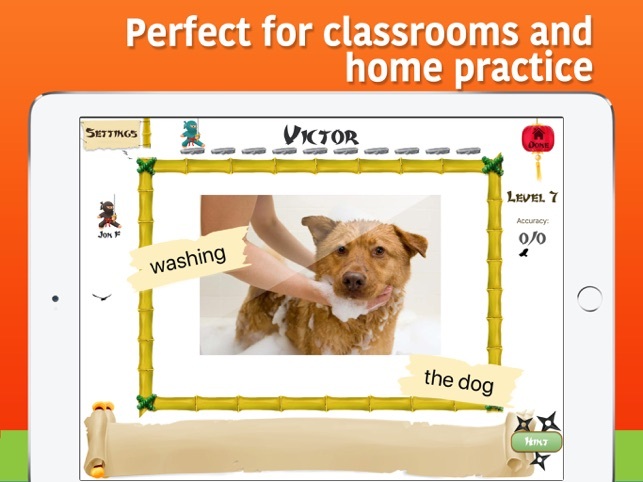 Sentence Ninja is designed to teach and reinforce the grammar rules of the English language for children, English language learners, and adults requiring rehabilitation. When playing Sentence Ninja, the active player is depicted by a ninja figure walking across stepping stones. Players waiting to take their turn are depicted on the side of the page. 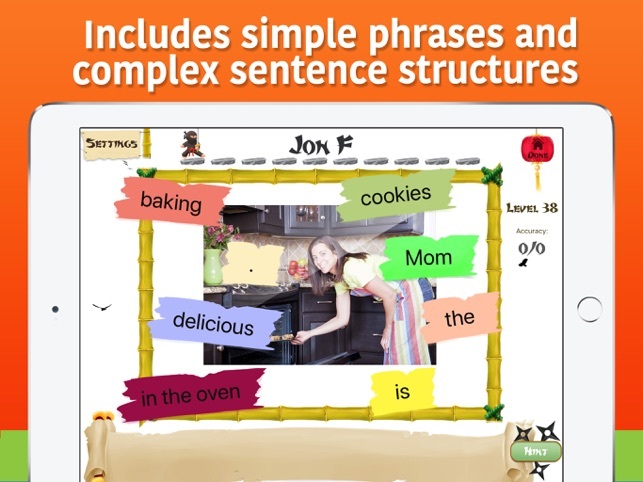 With each turn, a new picture is displayed with the phrase or sentence words shown on various pieces of paper. The player will drag the words, in order, to the sentence strip at the bottom of the page. If the sentence is not correct, the words will return to their position on the picture. When done with the session, a simple tap on the done button brings the user to the reports center. From the report center, a tap on the avatar of the client brings up the choice of report cards or awards and points. The awards and points center is a great way to help clients see the scores and any awards they have won throughout the game. 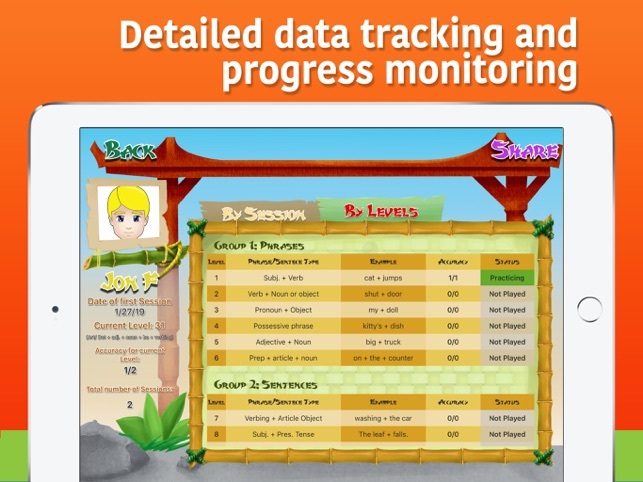 Report cards are kept for each session and available to track progress monitoring over time. 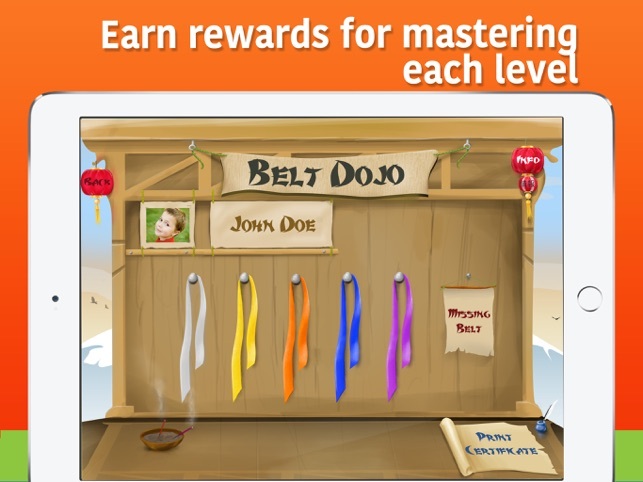 Sentence Ninja also includes several worksheets of various skill levels that are easily printed or emailed. Sentence Ninja has many customization choices from the “select a player” screen and from within each target page. 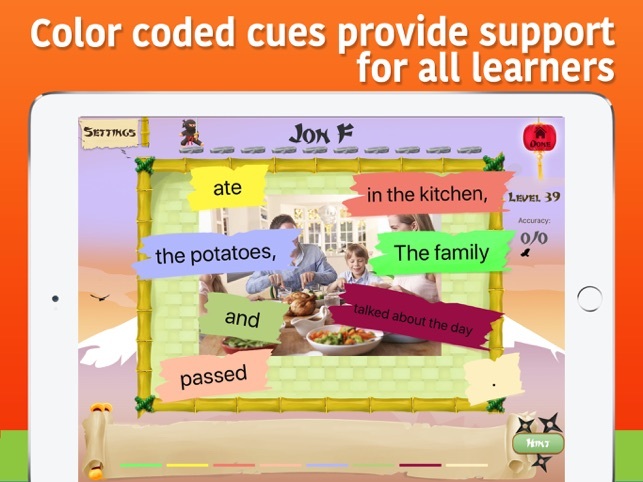 The facilitator can choose to record the students saying the sentences, display hints, automatically increase in complexity, or turn on color coding cues. In addition, the facilitator can select the “customize word list” to select/deselect item choices. I love that there are more advanced sentence structures and appropriate pictures for older students, which is why I was excited to buy it. For students with low frustration tolerance, the fact that the app rejects the entire sentence and kicks out all the words without leaving the ones that are in the right place intact is highly demotivating and has gotten some of my students to refuse to continue. Also, I've noticed that some of my students tend to try to drag sentence elements into the appropriate part of the sentence field (e.g. 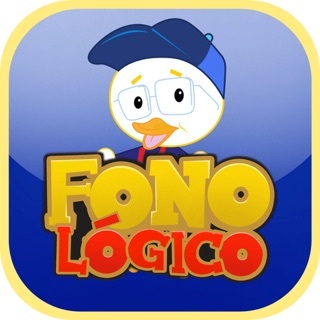 the capitalized word to he beginning, a prepositional phrase to the end) as they read each part, but the app doesn't let them do it successfully. I understand why it would make sense to require the user to assemble the sentence in correct sequence from the start, but try explaining that to my less flexible thinkers who are already struggling with syntax! 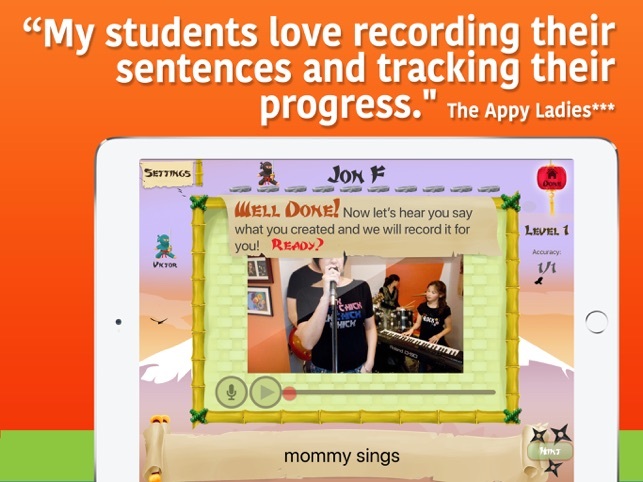 This app is so versatile because it contains so many levels of sentence structure! 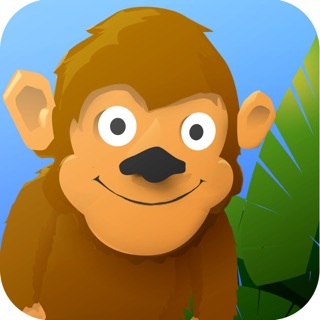 Your students do need basic reading skills, but other than that I use this app with my entire k-5 caseload. I work with mostly ELL students and this is a very effective way to work on sentence structure! The graphics are so fun and also appeal to a wide age range. 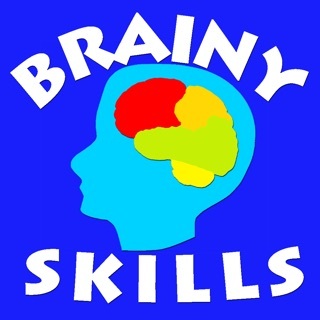 Another great app from Smarty Ears! Just what I needed for language therapy! 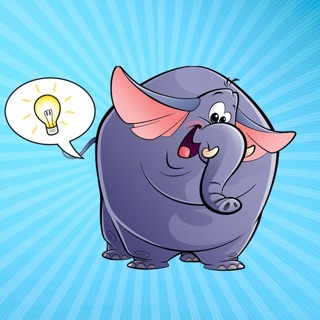 Excellent syntax app with 39 levels and great homework sheets ready to go! A must for SLPs!